The .303 British has 3.64 ml (56 grains H2O) cartridge case capacity. The pronounced tapering exterior shape of the case was designed to promote reliable case feeding and extraction in bolt action rifles and machine guns alike, under challenging conditions. .303 British maximum C.I.P. cartridge dimensions. All sizes in millimeters (mm). Americans would define the shoulder angle at alpha/2 ≈ 17 degrees. The common rifling twist rate for this cartridge is 254 mm (10.0 in) 10 in), 5 grooves, Ø lands = 7.70 millimetres (0.303 in), Ø grooves = 7.92 millimetres (0.312 in), land width = 2.12 millimetres (0.083 in) and the primer type is Berdan or Boxer (in large rifle size). According to the official C.I.P. (Commission Internationale Permanente pour l'Epreuve des Armes à Feu Portatives) rulings the .303 British can handle up to 365.00 MPa (52,939 psi) Pmax piezo pressure. In C.I.P. regulated countries every rifle cartridge combo has to be proofed at 125% of this maximum C.I.P. pressure to certify for sale to consumers. This means that .303 British chambered arms in C.I.P. regulated countries are currently (2014) proof tested at 456.00 MPa (66,137 psi) PE piezo pressure. The SAAMI (Sporting Arms and Ammunition Manufacturers' Institute) Maximum Average Pressure (MAP) for this cartridge is 49,000 psi (337.84 MPa) piezo pressure (45,000 CUP). The measurement .303-inch (7.70 mm) is the nominal size of the bore measured between the lands which follows the older black powder nomenclature. Measured between the grooves, the nominal size of the bore is .311-inch (7.90 mm). Bores for many .303 military surplus rifles are often found ranging from around .309-inch (7.85 mm) up to .318-inch (8.08 mm). Recommended bullet diameter for standard .303 British cartridges is .312-inch (7.92 mm). During a service life of over 70 years with the British Commonwealth armed forces the .303-inch cartridge in its ball pattern progressed through ten marks which eventually extended to a total of about 26 variations. The bolt thrust of the .303 British is relatively low compared to many other service rounds used in the early 20th century. The original .303 British service cartridge employed black powder as a propellant, and was adopted for the Lee–Metford rifle, which had rifling designed to lessen fouling from this propellant. The Lee–Metford was used as a trial platform by the British Committee on Explosives to experiment with many different smokeless powders then coming to market, including Ballistite, Cordite, and Rifleite. Ballistite was a stick-type smokeless powder composed of soluble nitrocellulose and nitroglycerine. Cordite was a stick-type or 'chopped' smokeless gunpowder composed of nitroglycerine, gun-cotton, and mineral jelly, while Rifleite was a true nitrocellulose powder, composed of soluble and insoluble nitrocellulose, phenyl amidazobense, and volatiles similar to French smokeless powders. Unlike Cordite, Riflelite was a flake powder, and contained no nitroglycerine. Excessive wear of the shallow Lee–Metford rifling with all smokeless powders then available caused ordnance authorities to institute a new type of barrel rifling designed by the RSAF, Enfield, to increase barrel life; the rifle was referred to thereafter as the Lee–Enfield. After extensive testing, the Committee on Explosives selected Cordite for use in the Mark II .303 British service cartridge. The initial .303 Mark I and Mk II service cartridges employed a 215-grain, round-nosed, copper-nickel full-metal-jacketed bullet with a lead core. After tests determined that the service bullet had too thin a jacket when used with cordite, the Mk II bullet was introduced, with a flat base and thicker copper-nickel jacket. In 1898, APX (Atelier de Puteaux), with their "Balle D" design for the 8mm Lebel cartridge, revolutionised bullet design with the introduction of pointed "spitzer" rounds. In addition to being pointed, the bullet was also much lighter in order to deliver a higher muzzle velocity. It was found that as velocity increased the bullets suddenly became much more deadly. In 1910, the British took the opportunity to replace their Mk VI cartridge with a more modern design. The Mark VII loading used a 174 gr (11.28 g) pointed bullet with a flat-base. The .303 British Mark VII cartridge was loaded with 37 gr (2.40 g) of Cordite MDT 5-2 and had a muzzle velocity of 2,440 ft/s (744 m/s) and a maximum range of approximately 3,000 yd (2,743 m). The Mk VII was different from earlier .303 bullet designs or spitzer projectiles in general. 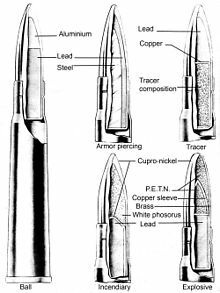 Although it appears to be a conventional spitzer-shape full metal jacket bullet, this appearance is deceptive: its designers made the front third of the interior of the Mk 7 bullets out of aluminium (from Canada) or tenite (cellulosic plastic), wood pulp or compressed paper, instead of lead and they were autoclaved to prevent wound infection. This lighter nose shifted the centre of gravity of the bullet towards the rear, making it tail heavy. Although the bullet was stable in flight due to the gyroscopic forces imposed on it by the rifling of the barrel, it behaved very differently upon hitting the target. As soon as the bullet hit the target and decelerated, its heavier lead base caused it to pitch violently and deform, thereby inflicting more severe gunshot wounds than a standard single-core spitzer design. In spite of this, the Mk VII bullet was legal due to the full metal jacket used according to the terms of the Hague Convention. The Mk VIIz (and later Mk VIIIz) rounds have versions utilizing 41 gr (2.66 g) Dupont No. 16 single-base smokeless powder based on nitrocellulose flake shaped propellants. The nitrocellulose versions—first introduced in World War I—were designated with a "z" postfix indicated after the type (e.g. Mark VIIz, with a bullet weight of 175 gr (11.34 g)) and in headstamps. .303 British cartridges, along with the Lee–Enfield rifle, were heavily criticized after the Second Boer War. Their heavy round-nosed bullets had low muzzle velocities and suffered compared to the 7×57mm rounds fired from the Mauser Model 1895. The high-velocity 7×57mm had a flatter trajectory and longer range that excelled on the open country of the South African plains. In 1910, work began on a long-range replacement cartridge, which emerged in 1912 as the .276 Enfield. The British also sought to replace the Lee–Enfield rifle with the Pattern 1913 Enfield rifle, based on the Mauser M98 bolt action design. Although the round had better ballistics, troop trials in 1913 revealed problems including excessive recoil, muzzle flash, barrel wear and overheating. Attempts were made to find a cooler-burning propellant, but further trials were halted in 1914 by the onset of World War I. As a result, the Lee–Enfield rifle was retained, and the .303 British cartridge (with the improved Mark VII loading) was kept in service. In 1938 the Mark VIIIz "streamline ammunition" round was approved to obtain greater range from the Vickers machine gun. The streamlined bullet was slightly longer and heavier than the Mk VII bullet at 175 gr (11.34 g), the primary difference was the addition of a boat-tail at the end of the bullet and using 37 to 41 gr (2.40 to 2.66 g) of nitrocellulose smokeless powder as propellant in the case of the Mk VIIIz, giving a muzzle velocity of 2,525 ft/s (770 m/s). As a result, the chamber pressure was higher, at 40,000 to 42,000 psi (275.8 to 289.6 MPa), depending upon loading, compared to the 39,000 psi (268.9 MPa) of the Mark VII(z) round. [ The Mark VIIIz streamline ammunition had a maximum range of approximately 4,500 yd (4,115 m). Mk VIIIz ammunition was described as being for "All suitably-sighted .303-inch small arms and machine guns" – rifles and Bren guns were proofed at 50,000 psi (344.7 MPa) – but caused significant bore erosion in weapons formerly using Mk VII cordite, ascribed to the channelling effect of the boat-tail projectile. As a result, it was prohibited from general use with rifles and light machine guns except when low flash was important and in emergencies As a consequence of the official prohibition, ordnance personnel reported that every man that could get his hands on Mk VIIIz ammunition promptly used it in his own rifle. Tracer and armour-piercing cartridges were introduced during 1915, with explosive Pomeroy bullets introduced as the Mark VII.Y in 1916. Several incendiaries were privately developed from 1914 to counter the Zeppelin threat but none were approved until the Brock design late in 1916 as BIK Mark VII.K Wing Cmdr. Frank Brock RNVR, its inventor, was a member of the Brock fireworks-making family. Anti-zeppelin missions typically used machine guns loaded with a mixture of Brock bullets containing potassium chlorate, Pomeroy bullets containing dynamite, and Buckingham bullets containing pyrophoric yellow phosphorus. A later incendiary was known as the de Wilde, which had the advantage of leaving no visible trail when fired. The de Wilde was later used in some numbers in fighter guns during the 1940 Battle of Britain. These rounds were extensively developed over the years and saw several Mark numbers. The last tracer round introduced into British service was the G Mark 8 in 1945, the last armour-piercing round was the W Mark 1Z in 1945 and the last incendiary round was the B Mark 7 in 1942. Explosive bullets were not produced in the UK after 1933 due to the relatively small amount of explosive that could be contained in the bullet, limiting their effectiveness, their role being taken by the use of Mark 6 and 7 incendiary bullets. In 1935 the .303 O Mark 1 Observing round was introduced for use in machine guns. The bullet to this round was designed to break up with a puff of smoke on impact. The later Mark 6 and 7 incendiary rounds could also be used in this role. During World War I British factories alone produced 7,000,000,000 rounds of .303 ammunition. Factories in other countries added greatly to this total. Military surplus .303 British ammunition that may be available often has corrosive primers, given the mass manufacture of the cartridge predates Commonwealth adoption of non-corrosive primers concurrent with the adoption of 7.62 NATO in 1955. There is no problem with using ammunition loaded with corrosive primers, providing that the gun is thoroughly cleaned after use to remove the corrosive salts. The safe method for all shooters of military surplus ammunition is to assume the cartridge is corrosively primed unless certain otherwise. Care must be taken to identify the round properly before purchase or loading into weapons. [according to whom?] Cartridges with the Roman numeral VIII on the headstamp are the Mark 8 round, specifically designed for use in Vickers machine guns. Although Mark 8 ammunition works well in a Vickers gun, it should not be used in rifles because the cordite powder causes increased barrel wear. The boat-tailed bullet design of Mk 8 ammunition is not in itself a problem. However, when combined with the cordite propellant used in Mk 8 cartridges, which burns at a much higher temperature than nitrocellulose, there is increased barrel erosion. The cumulative effects of firing Mk 8 ammunition through rifles were known during the Second World War, and British riflemen were ordered to avoid using it, except in emergencies. The best general-purpose ammunition for any .303 military rifle is the Mark 7 design because it provides the best combination of accuracy and stopping power. Japan produced a number of machine guns that were direct copies of the British Lewis (Japanese Type 92 machine gun) and Vickers machine guns including the ammunition. These were primarily used in Navy aircraft. The 7.7mm cartridge used by the Japanese versions of the British guns is a direct copy of the .303 British (7.7×56mmR) rimmed cartridge and is distinctly different from the 7.7×58mm Arisaka rimless and 7.7×58mm Type 92 semi-rimmed cartridges used in other Japanese machine guns and rifles. Ball: 174 grains (11.3 g). Cupro-Nickel jacket with a composite aluminium/lead core. Black primer. Armour-Piercing. : Brass jacket with a steel core. White primer. Tracer: 130 grains (8.4 g). Cupro-Nickel jacket with a lead core. Red primer. Incendiary: 133 grains (8.6 g). Brass jacket with white phosphorus and lead core. Green primer. H.E. : Copper jacket with a PETN and lead core. Purple primer. Note: standard Japanese ball ammunition was very similar to the British Mk 7 cartridge. The two had identical bullet weights and a "tail-heavy" design, as can be seen in the cut-away diagram. The .303 cartridge has seen much sporting use with surplus military rifles, especially in Australia, Canada, New Zealand and to a lesser extent, in the United States and South Africa. In Canada, it was found to be adequate for any game except the great bears. In Australia, it was common for military rifles to be re-barreled in .303/25 and .303/22. However the .303 round still retains a considerable following as a game cartridge for all game species, especially Sambar deer in wooded country. A recent change.org petition seeking Lithgow Arms to chamber the LA102 centerfires rifle in .303 as a special edition release has attracted considerable attention both in Australia and worldwide. In South Africa .303 British Lee–Enfield rifles captured by the Boers during the Boer War were adapted for sporting purposes and became popular with many hunters of non-dangerous game, being regarded as adequate for anything from the relatively small impala, to the massive eland and kudu. Commercial soft point .303 British loaded in a Lee–Enfield five-round charger. Civilian soft point .303 ammunition, suitable for hunting purposes. The .303 British is one of the few (along with the .22 Hornet, .30-30 Winchester, and 7.62×54mmR) bottlenecked, rimmed centerfire rifle cartridges still in common use today. Most of the bottleneck rimmed cartridges of the late 1880s and 1890s fell into disuse by the end of the First World War. Commercial ammunition for weapons chambered in .303 British is readily available, as the cartridge is still manufactured by major producers such as Remington, Federal, Winchester, Sellier & Bellot, Prvi Partizan and Wolf. Commercially produced ammunition is widely available in various full metal jacket bullet, soft point, hollow point, flat-based and boat tail designs—both spitzer and round-nosed. Reloading equipment and ammunition components are also manufactured by several companies. Dies and other tools for the reloading of .303 British are produced by Forster, Hornady, Lee, Lyman, RCBS, and Redding. Depending on the bore and bore erosion a reloader may choose to utilize bullet diameters of .308–.312" with .311" or .312" diameter bullets being the most common. Bullets specifically produced and sold for reloading .303 British are made by Sierra, Hornady, Speer, Woodleigh, Barnes, and Remington. Where extreme accuracy is required, the Sierra Matchking 174-grain (11.3 g) HPBT bullet is a popular choice. Sierra does not advocate use of Matchking brand bullets for hunting applications. For hunting applications, Sierra produces the ProHunter in .311" diameter. The increasingly popular all-copper Barnes TSX is now available in the .311" diameter as a 150 gr projectile which is recommended by Barnes for hunting applications. With most rifles chambered in .303 British being of military origin, success in reloading the calibre depends on the reloader's ability to compensate for the often loose chamber of the rifle. Reduced charge loads and neck sizing are two unanimous recommendations from experienced loaders of .303 British to newcomers to the calibre. The classic 174-grain (11.3 g) FMJ bullets are widely available, though purchasers may wish to check whether or not these feature the tail-heavy Mk 7 design. In any case other bullet weights are available, e.g. 150, 160, 170, 180, and 200-grain (13 g), both for hunting and target purposes. The .303 British cartridge is suitable for all medium-sized game and is an excellent choice for whitetail deer and black bear hunting. In Canada it was a popular moose and deer cartridge when military surplus rifles were available and cheap; it is still used. The .303 British can offer very good penetrating ability due to a fast twist rate that enables it to fire long, heavy bullets with a high sectional density. Canadian Rangers use it for survival and polar bear protection. In 2015, the Canadian Rangers began the process to evaluate rifles chambered for .308 Winchester, as the Canadian Department of National Defence expects the currently issued Lee–Enfield No. 4 rifles will soon be very difficult if not impossible to maintain due to parts scarcity. Canadian Ellwood Epps, founder of Epps Sporting Goods, created an improved version of the .303 British. It has better ballistic performance than the standard .303 British cartridge. This is accomplished by increasing the shoulder angle from 16 to 35 degrees, and reducing the case taper from .062 inches to .009 inches. These changes increase the case's internal volume by approximately 9%. The increased shoulder angle and reduced case taper eliminate the drooping shoulders of the original .303 British case, which, combined with reaming the chamber to .303 Epps, improves case life. ^ ".303 British" (PDF). Accurate Powder. Archived from the original (PDF) on 30 December 2008. ^ "SAAMI Drawing 303 British" (PDF). Archived from the original (PDF) on 25 December 2014. Retrieved 25 December 2014. ^ a b David Cushman. "History of the .303 British Calibre Service Ammunition Round". ^ Hornady Handbook of Cartridge Reloading, Rifle-Pistol, Third Edition, Hornady Manufacturing Company, 1980, 1985, p.253-254. ^ "REJECTED MARK IV. BULLETS". ^ "Dum Dums". Archived from the original on 25 September 2008. Retrieved 21 August 2008. ^ "Rifle, Short Magazine Lee–Enfield". The Lee–Enfield Rifle Website. Retrieved 13 May 2010. ^ "The .303 British Cartridge". Archived from the original on 29 April 2007. Retrieved 13 May 2007. ^ Dunlap, Roy F., Ordnance Went Up Front, Samworth Press (1948), ISBN 978-1-884849-09-1 p. 40: There appear to have been two distinct loadings of the Mark VIII cartridge: one small arms expert serving with the Royal Army Ordnance Corps at Dekheila noted that Mk VIIIz ammunition he examined had a claimed muzzle velocity of 2,900 ft/s (884 m/s), furthermore, primers on MK VIIIz fired cases he examined looked "painted on", normally indicating a pressure of around 60,000 psi (413.7 MPa). ^ Temple, B.A. Identification Manual on the .303 British Service Cartridge No.1 - Ball Ammunition. ^ Labbett, P.; Mead, P.J.F (1988). "Chapter 5, .303 inch Incendiary, Explosive and Observing Ammunition". .303 inch: a history of the .303 cartridge in British Service. authors. ISBN 978-0-9512922-0-4. ^ "The Brock Bullet Claim" (PDF). flightglobal.com. Flight Aircraft Engineer Magazine. Retrieved 12 August 2018. ^ Featherstone-Haugh, JJ. (1973). "Appendix VII, page IV, "British Military Output WWI"". Home Front - Untold Tales of British Workers during the Great Wars. OUP. ^ Walter H.B. Smith, Small Arms of the World, Stackpole Publications. ^ Hawks, Chuck. "Matching the Gun to the Game". ChuckHawks.com. Archived from the original on 20 August 2010. Retrieved 6 September 2010. ^ "303 Epps - Notes on Improved Cases". Archived from the original on 2 July 2017. Retrieved 23 April 2018. Wikimedia Commons has media related to .303 British. "Photos of the contents of different .303 British cartridges". Box of Truth website. 2014-06-13. "Photo of Sellier & Bellot 150 gr (9.7 g) .303 British soft-point fired into ballistic gelatin (bullet travelled right to left)". Archived from the original on 19 December 2008. Retrieved 21 August 2018. "Photos of various different types of .303 ammunition". "Africa". Sniper Central. Archived from the original on 2006-03-14. David Cushman. "Headstamps of various .303 ammunition producers".